You can grab a package from https://launchpad.net/%7Efoobnix-player/+archive/foobnix/+packages as I have done before, but some of these packages just don't work. And installing with gdebi did not pull in all the dependencies ( I also had to install python-dbus, gstreamer0.10-plugins-bad and gstreamer0.10-plugins-ugly ). Just found out that there is a package at http://www.debian-multimedia.org/ ( unstable/Sid ). Download foobnix_2.5.23-0.0_all.deb from : http://www.debian-multimedia.org/dists/unstable/main/binary-amd64/package/foobnix.php . 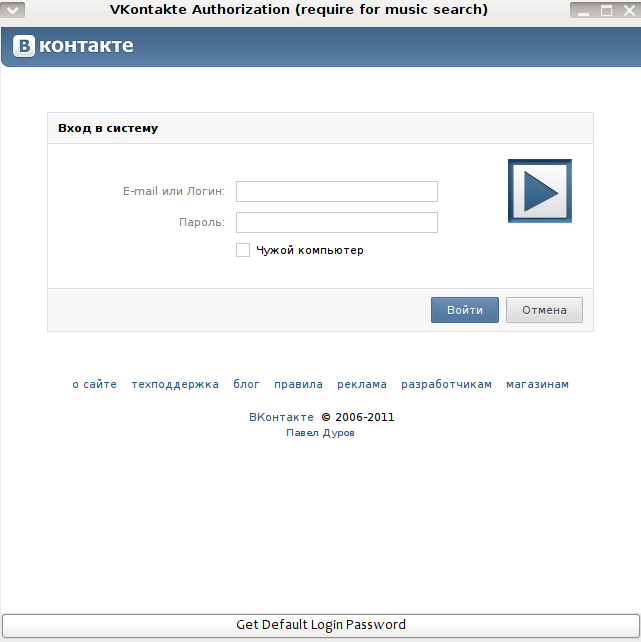 Description: Simple and powerful music player for Linux. I used gdebi to install foobnix with all its dependencies. Pressing the Open button brought me to a loginpage at Vkontakte.....( http://en.wikipedia.org/wiki/Vkontakte ). will pull in : python-webkit, libwebkit-1.0-2 and libwebkit-1.0-common. I download the songs to a folder Music in my home directory. In the left pane in foobnix : Add Folder(s) in tree ( in my case ~/Music ). Downloaded songs appear in left pane after updating ( rightclick in left pane > Update ) or go to Preferences > Music Library > check Update library on start . You can download songs as well at Legalsounds for $0.09 per mp3.